During our stay in Portland, we ventured out of the city limits into the Willamette Valley, where the hills are rolling and the wines were flowing. Not surprisingly, there was tons of great food to be found - some of it in the most unusual places such as the BBQ joint I'm about to describe. 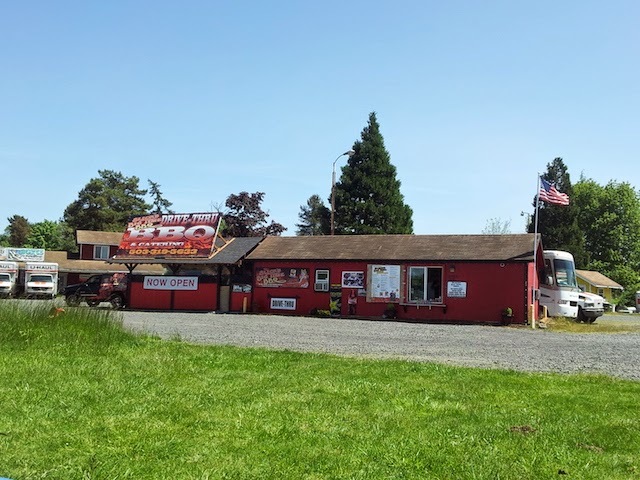 While on our way to Champoeg State Park, Dan and I spotted a BBQ truck that advertised a drive thru restaurant. A novel concept for us, we were intrigued but had no real intentions to try it, until a few hours later when we got hungry. Turning out to be one of our foodie stand-outs of the trip, we didn't regret our decision. Located in Newberg, Oregon, just a short drive from several spectacular wineries and beautiful outdoor destinations, Slick's is a perfect pit stop for satisfying your hunger while on the road. You can drive thru obviously, which is part of its charm, however we decided to dine in their small outdoor picnic table area. While simple, Slick's concept works well to deliver a unique culinary experience and great customer service. Not long after ordering at their pick-up window, we were ushered back with the sound of a cow bell, which was both amusing and awesome. While the picnic area wasn't crowded, we noticed a few people driving by and leaving with their BBQ. 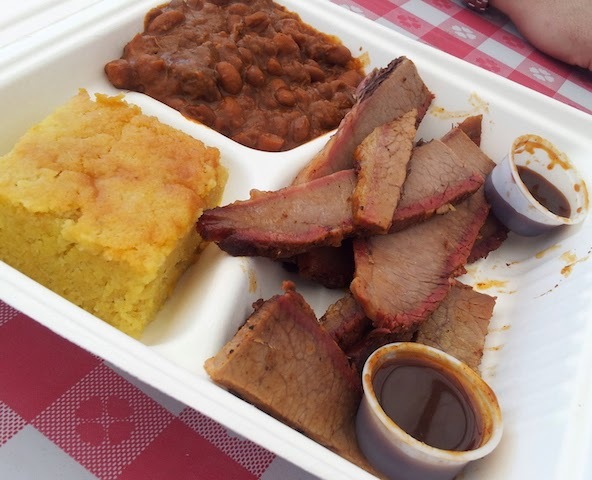 Even though everything on the menu sounded tempting, we went for a simple low & slow brisket platter with a side of pulled pork baked beans and cornbread. A total home run, the meat was super flavorful, boasting a beautiful smoke ring around the edges. While the middle was a tad dry for my taste, the corners were absolutely perfect, with crunchy, well done skin. The sides were also spectacular, and I couldn't stop devouring the moist cornbread, which almost tasted like corn bread pudding. We chatted with Dan, Slick's owner who revealed the cornbread is a secret recipe of his wife's who also makes it into a decadent strawberry shortcake dessert. Although this is a no frills type of place, the service was warm and friendly and we enjoyed speaking with Dan who made sure we had a great experience. Overall, Slick's infuses an old town feel into this well trafficked region, especially during prime wine tasting season (aka now). Costs are inexpensive and the above platter set us back just $10, which is a great value for such a delicious feast. Do try it if you happen to be in the area at some point!